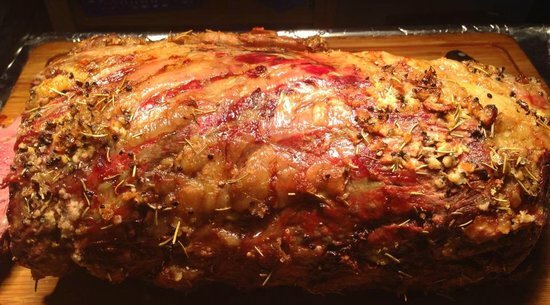 While you’re having Maui style fun, there’s no doubt you’ll work up an appetite. And if you want to satisfy your hunger like a local, I have a few places in mind that you’ll have to check out. 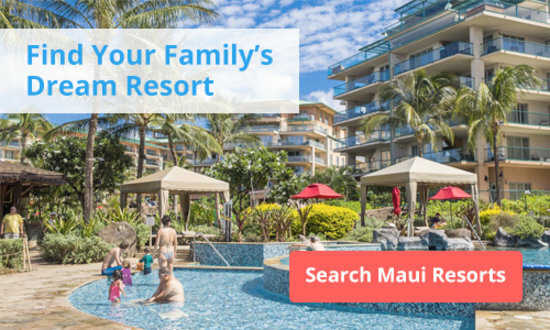 All the places on this list are family friendly and very affordable. 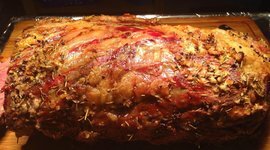 So, here are some of my favorite Maui restaurants that you might like too. 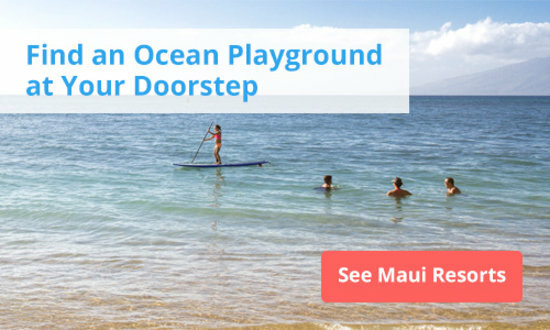 Koa’s is located on Front Street overlooking the Pacific and the island of Lanai in the distance. It’s got a very local, casual dining atmosphere. My favorite is breakfast with a side of pancakes that are fluffy to the max! And their Crab Cake Benedict, which come with griddled local Kamuela Tomato and homemade hollandaise, really starts off the morning perfectly. It’s a great family place. As always, my buddy Buff should be there, so say hello. These are the Hawaiian foods you may be looking for. 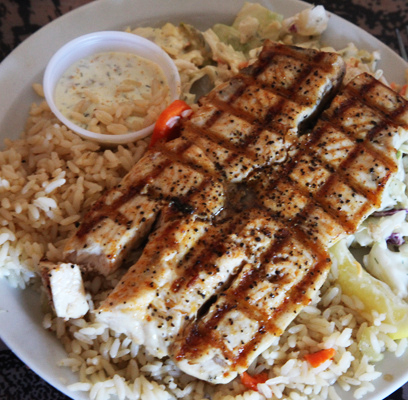 Get the Ali`i Plate, a hefty lunch plate that’s all about classic Hawaiian cuisine. 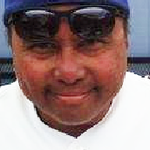 In fact, Ali`i means “chief” in the Hawaiian language. You get Lau Lau, which is pork seasoned with Hawaiian salt, wrapped in taro leaves, then ti leaves, and cooked in the traditional underground oven called an “imu.” The rest of the plate has Kalua Pork with Cabbage, Lomi Salmon, and of course Poi, which is like a taro pudding. It also comes with a coconut dessert called Haupia. It’s a good bet that several kids can share one of these plates, while dad might be able to eat the whole thing! This Filipino-influenced eatery is located in the same shopping complex as Zushi. 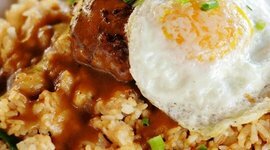 They have some great specials on the menu, but what they’re really known for is their mouth-watering Pork Adobo, a braised pork dish marinated in vinegar, soy sauce, and some spices, very simple, and served with rice. But be careful here! The portions are so filling that they can put you to sleep. 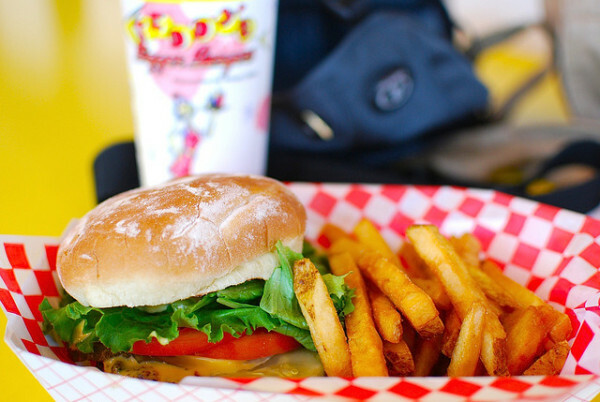 This little joint is Maui’s answer to In-N-Out Burger. The whole place is 50’s themed with oldies music coming out the speakers. Really great for families because they have some of the best burgers on the island, all grilled fresh. They also have chicken and veggie burgers on the menu. But for yours truly, I always ask for a “Number Four,” which is a whopping 10 ounce burger (two 5 ounce patties) with cheddar cheese, no sauce, lettuce, tomato, and onions. And don’t forget the regular fries and a Coke. It comes out to twelve dollars, so it’s affordable for sure. 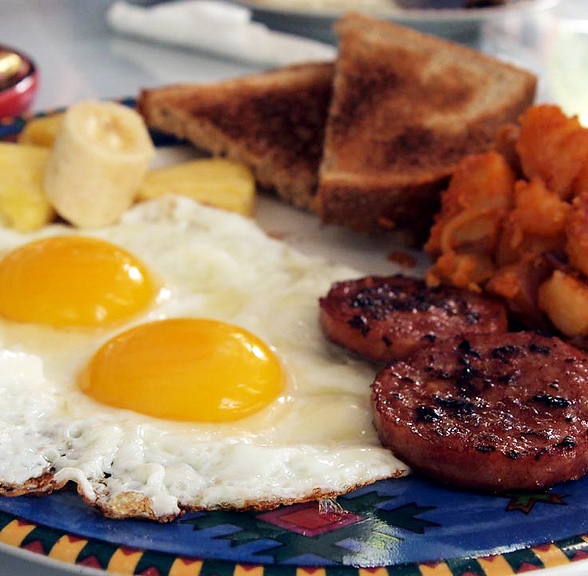 Sunrise is the ultimate breakfast eatery, and as you know by now I’m big on breakfast. My favorite dish is their Lox and Bagel Benedict on a toasted bagel with slices of smoked salmon, two poached eggs, and topped with a rich hollandaise sauce, and a side of potatoes. 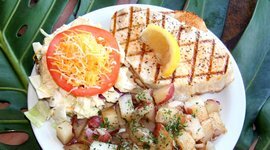 And it’s right next to the Lahaina Harbor, so if you’re going on a boat cruise, stop by for breakfast, it’s a winner. Family friendly all the time. 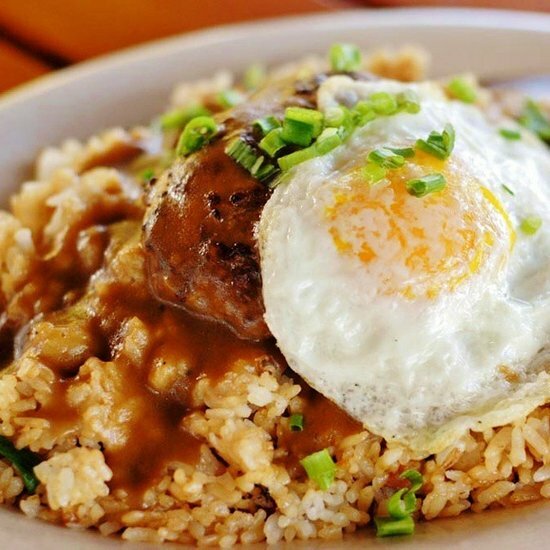 Da Kitchen is another essential favorite among locals, and they’ve got a couple locations on Maui. It’s totally local plates, and I wish I could eat here every day. 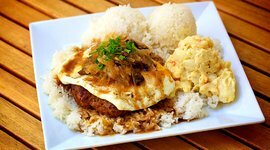 I go for the Loco Moco beef patties, eggs, gravy and rice, or the Katsu Moco with hamburger, katsu, eggs, rice, and gravy. And the salads here are awesome too. Their Chinese Chicken Salad is the hot fire. One of my favorite Mexican restaurants in Maui, this place is very casual and very affordable. When I’m on the road, I hit the one in Kihei in South Maui. Being a big breakfast man, I love it because it’s all day baby! 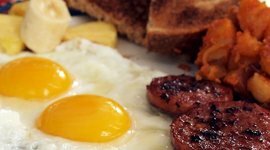 I go for the Chorizo con Huevos. And their chorizo is marinated, so it’s really tasty. Or if I’m hungry, I’ll hit the Steak and Eggs. 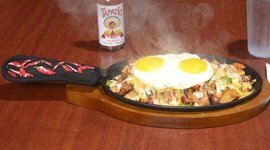 The steak is soft and served with potatoes, two over-easy eggs, and flour tortillas. Lunch or dinner? Hey it’s all about the Al Pastor Soft Tacos with rice and beans. This is my favorite place on the way to Hana. I’m a very simple man to please if the food is cooked and executed right. Okay, this is the bomb: Fish and Chips with breaded Mahi Mahi covered in their homemade breadcrumbs. Now that’s putting love into every dish. Comes with a tartar over a bed of greens and fries. It’s my personal fave and might be yours too once you give it a try. 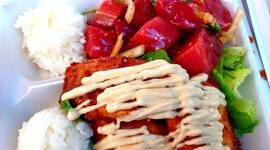 “Like Poke?” is the name of a Food Truck, and the last, but not least place you got to check out. 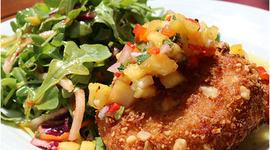 Since this is Maui, let’s go with fish, Ahi of course – the prized fish – the yellow fin king of all tunas. If you love fish, and especially tuna, this place is a must visit. It’s great coming here on a nice day and sitting outside on the tables in the shade. Poke is pronounced (Po-keh), which is cubed raw tuna marinated and then served as is or wok fried. This classic Hawaiian food is becoming a staple in many high-end digs. But my fave dish? 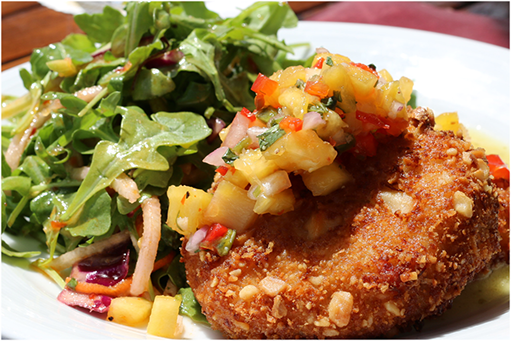 It’s the Ahi Katsu, juicy pieces of Ahi crusted in panko and then fried until golden brown. It’s dressed in soy sauce, mayonnaise, and served with rice. So good! Kids will love it, even if they don’t like fish. 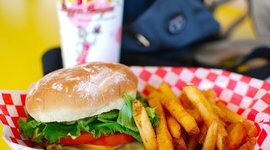 It's Maui's answer to In-N-Out Burger and the best spot on the island to grab a tasty burger and fries. It's a favorite spot among locals for their decadent Katsu Moco with delicious gravy. For something light, try their Chinese Chicken Salad. Mouth-watering Pork Adobo is marinated to perfection at this local hole in the wall. 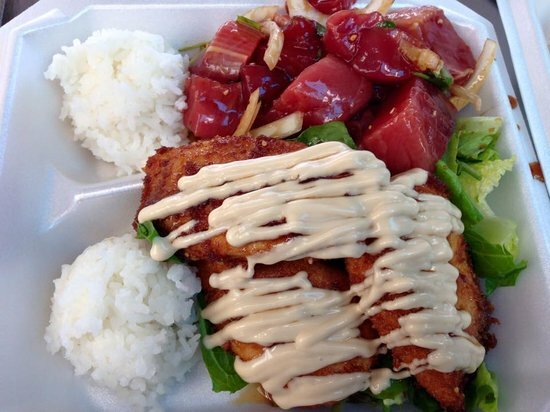 Poke, or raw cubed, marinated fish is a centuries-old Hawaiian specialty. This food truck serves it straight up or fried. Pick up a burrito, taco, or enchilada at one of their three locations in Maui.